This slow roasted duck is the Accidental Locavore’s favorite way to roast a duck. If you’ve got an afternoon, and need an excuse to binge watch ______, this is your meal. The fact that it couldn’t be easier, or more delicious, are just bennies. A V-shaped roasting rack helps, but you can do it with a regular rack and roasting pan. Clean-up is much easier if you lightly oil the rack. Rinse and dry the duck. Salt and pepper it, inside and out, and if you’re using them toss some peeled garlic cloves, orange or lemon chunks and herbs inside. Prick the duck all over with a fork, and put it on the rack in the roasting pan. Remove it, turn it over, and prick it with the fork. Do this total of 4 times (4 hours). After the last time, turn the oven up to 400°, and put the duck back in for 15-30 minutes, depending on how crispy you like the skin. 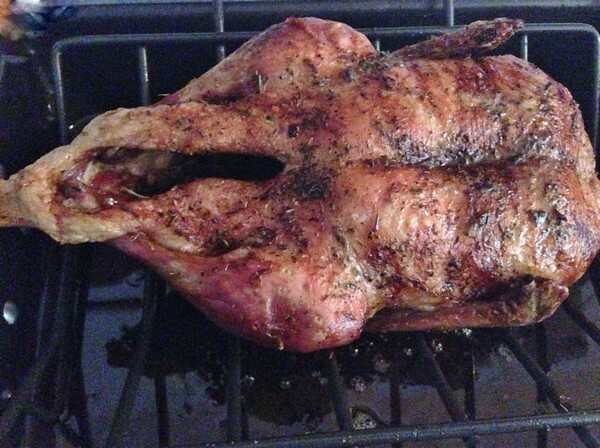 My verdict: I can’t tell you how many times I’ve made this duck. It’s great and foolproof! 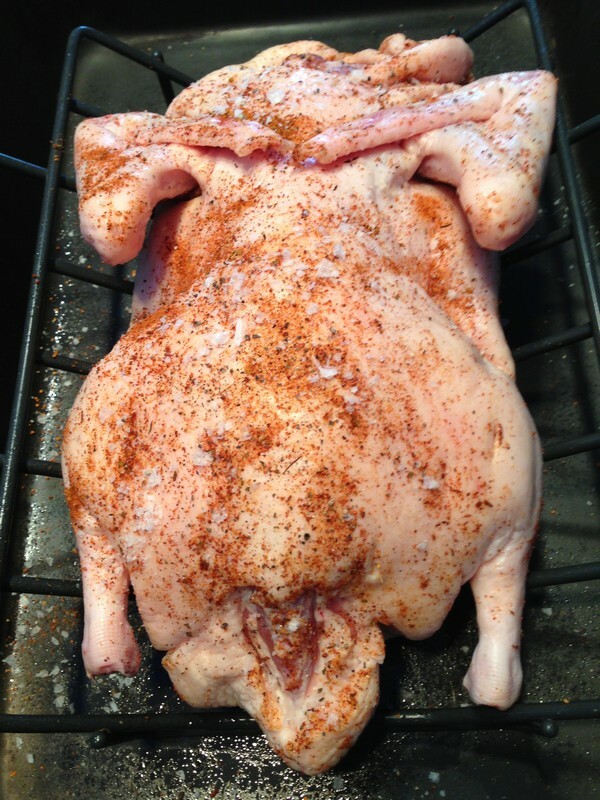 You can rub the duck with any spice mix, or just simply salt and pepper. I happen to like barbecue sauce with duck, the plum hoisin sauce is also great with it, and often take some of my cousin Ellen’s amazing clementine marmalade, warm it with some citron vodka, and a tablespoon of maple syrup to thin it down with, making a my version of duck à l’orange. Don’t forget to save the fat (run it through a fine strainer or coffee filter) to sautée some spinach or roast potatoes with. 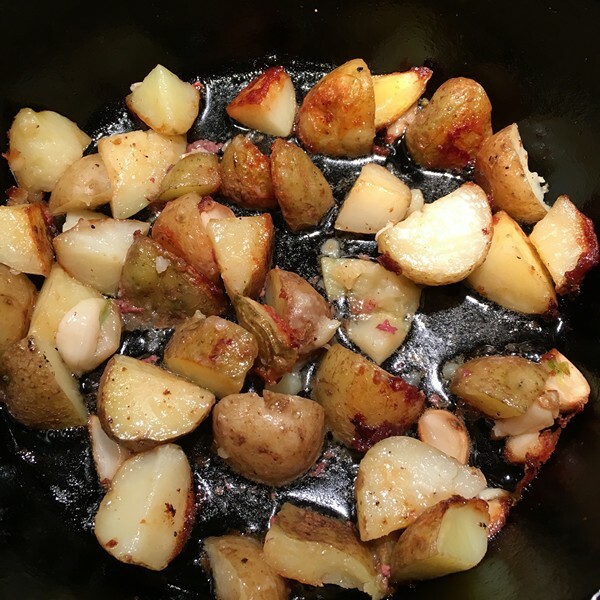 Speaking of potatoes, some par-boiled chunks of potatoes tossed in the bottom of the roasting pan for the last 15-30 minutes, are always incredible!